Bald eagles usually nest high up in trees, but the problem is that Unalaska doesn’t have too many trees, so the birds build their nests on cliffs on the edge of town or in man-made structures, which makes them more accessible to nosy humans. It’s easy to get a little too close to an eagle nest without even knowing it, which is why local law enforcement puts up warning signs all through the nesting season – from early June to the end of the summer. 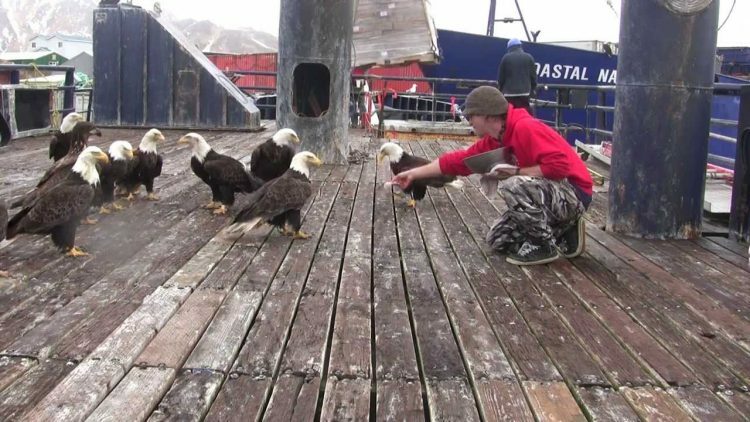 But even so, Unalaska sees between six and ten cases in which people require medical attention after encounters with eagles. “We actually have had to go in and chase some eagles off the playground equipment at the town park, because a couple of kids had been trapped inside,” Shockley added. But why are there so many bald eagles in this particular? Unalaska Island is almost 80 miles long, but the birds choose to live in an area of only a few square miles. Well, as you’ve probably already guessed, it has to do with food. The Alaskan town is located right next to Dutch Harbor, one of the largest fishing ports in the world, and fish is a staple of the eagles’ diet. Every time a boat pulls in to offload, they swoop in and grab as much fish as they can get, before the crew drives them away. And then there is the local landfill, another favorite place to hang out for the local bald eagle population. They are scavengers, so they spend a lot of time looking for food through trash. Anything that even looks edible will catch their attention. While the people of Unalaska love their eagles, many of them do consider them pests, kind of like people see pigeons in other places. They make a mess wherever they go, but whereas pigeons will run away when humans approach, bald eagles will attack you if they perceive you as a threat. The post office is famous as one of the most popular nesting places for the eagles, which also makes it a notoriously dangerous place to visit. A simple errand to mail a letter is likely to put in the hospital with deep flesh wounds. The sight of so many bald eagles in such a small town is especially impressive for newcomers. Seeing them perched on virtually every lamp post, looking for food in trash cans or just flying overhead with their wings fully extended makes quite an impact on people.